On the cruise ship I happened to meet one of my classmates who attended a conference on the same ship. It was not very uncommon because she works for the same employer as I do, the municipality of Turku. The amazing thing was that we already had arranged a meeting for Saturday. 35 years have passed since we graduated from the Gymnasium (check the link for more information). We have had these reunions before, the last one 5 years ago. The group has stayed together; at least someone knows about those who could not attend this time. There was only 17 of us on the class and 11 showed up. The school we attended had an interesting start. The school was founded three years before I started it and at the time we did not have a building. 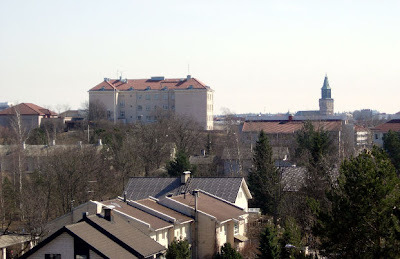 This is the picture with my elementary school and the gymnasium was hosted in some extra buildings around that school. Those buildings were old, the first ones built in 1899. Today those old wooden buildings are gone, replaced by the lower building on the left. There was not enough room for all the classes and sometimes the classes took place in the dressing room of the sports grounds down the hill like you can see in this picture. We even demonstrated on the streets of Turku carrying posters "We need a school buiding". This picture was published in the newspapers at that time. We got the building when I was on the fifth class (of 8). We got to spend the last four in a brand new place. 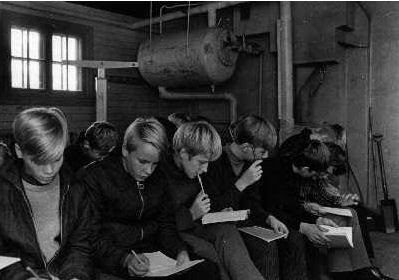 The school was not very popular in those times but soon after I graduated it became one of the most hardest schools to get in. It also changed targeting to science. Here is the building and basically nothing has changed from the original. The reunion started in the school. Also 3 teachers came to see us, the principal, our English teacher who also was responsible for our class and our German teacher. Because the school was new when we started it, most of our teachers were very young then and most of them have retired not so long ago. We were at the same time having a burial of the gymnasium. 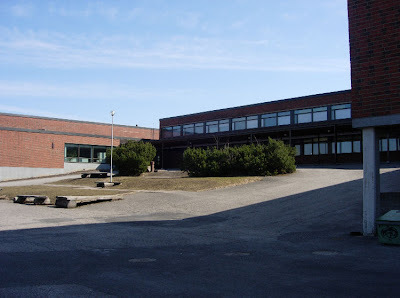 The name of the school had changed earlier but now the whole school has been integrated to another gymnasium in Turku and the building is used by lower classes only. I also worked in the same school two years after I became a teacher so this did not come to me as a surprise; the interior of the school is still mostly the same. The walls have been painted lighter. The originals were dark green, red, and brownish yellow. We drank coffee in the school, took a tour and talked. After that we continued the discussion at dinner in a restaurant in Turku. We had a wonderful time! It is amazing to notice now how original and strong personalities we were already 35 years ago. It was like going back in time; even though we all look older, we still have the same characteristics and interests. I admit I was very lucky to be in that class. Those were probably the happiest years of my life. During all my teacher years I have not seen group spirit like that. Also the teachers were part of our group and we shared wonderful memories together.